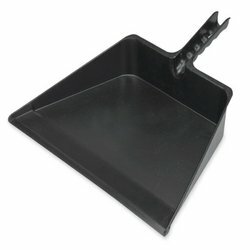 Jumbo Dust Pan is lightweight yet strong with a styrene resin construction. 18 wide mouth is designed for large debris. Ideal for outdoor maintenance such as picking up leaves and other debris that requires a large capacity. Contoured handle has a hang hole and also fits on standard brooms or rake handles for easy storage and accessibility. Rubber feet prevent sliding on smooth surfaces. Jumbo Dust Pan is lightweight yet strong with a styrene resin construction. 18" wide mouth is designed for large debris. Ideal for outdoor maintenance such as picking up leaves and other debris that requires a large capacity. Contoured handle has a hanging hole and also fits on standard brooms or rake handles for easy storage and accessibility. Rubber feet prevent sliding on smooth surfaces. If you have any questions about this product by Wilen Professional, contact us by completing and submitting the form below. If you are looking for a specif part number, please include it with your message.